This site provides detailed field research summaries and thematic analysis on local, hybrid and sub-state security forces in Iraq (LHSFs). Findings from this research are also available in a condensed report (download the full report and the executive summary from the left hand menu). Regional or community forces, militias, and other forms of local security actors have long existed in Iraq. However, when the so-called Islamic State in Iraq and the Levant (ISIL) took over large swaths of territory in 2014, Iraqi government control splintered and the number of local, hybrid, or sub-state security forces (LHSFs, as we refer to them) proliferated. Critical among these were the long-standing, 200,000-strong Kurdish Regional Government (KRG) forces, and the roughly 160,000 member (and growing) Popular Mobilization Forces (PMF). The PMF (also known as al-hashd ash-sha’abi, or simply hashd) is an umbrella group of different militia or sub-state forces that was granted formal status by Parliament in November, 2016. A plethora of smaller forces drawn from local communities taken by ISIL also emerged, including Sunni tribal forces, and Turkmen, Yezidi, Christian and other minority defense forces. In the first half of 2017, GPPi, together with IRIS at the American University in Sulaimaini, conducted research examining the role LHSFs were playing in local communities and the impact for local and national dynamics.1 This webpage acts as the main landing page for sharing the data and analysis from that field research, and will be updated as new material becomes available. Tikrit and surrounding areas (Al-Alam, Daur) – Shi’a PMF and local tribal Sunni Arab hashd hold off ISIL on the frontline in Daur, but their strong presence, and periodic outbreaks of violence and looting challenge ISF’s ability to maintain rule of law in Salah ad-Din’s capital area. Tuz – PMF and Kurdish forces are locked in a stalemate in Salah ad-Din’s only Disputed Territory. Still under split control two years after ISIL’s ouster, the district capital is divided, while local Shi’a militias prevent Sunni Arabs and Sunni Turkmen from returning to their homes in their southern area of control. Rabi’a – A test of the Disputed Territories boundary line, this predominantly Sunni Arab area in Tal Afar district has flipped to Kurdish control after ISIL’s ouster, and local tribal forces have formed units under KDP Peshmerga. Zummar – A focal point of Kurdish claims within Iraq’s Disputed Territories, Zummar is now under the firm control of Kurdish forces, with local Arab and Kurdish tribal forces providing additional security support to Kurdish forces; return of Arabs to Zummar has been fraught with controversy. Tal Afar City – Shi’a Arab PMF from the south have been the main forces present around this ISIL-held area, but if they retake this mixed Sunni-Shi’a Turkmen city, it may spark sectarian and regional conflict. Mosul – Only fully liberated in July 2017, half of the city is severely damaged while weak rule of law allows ample opportunities for a range of armed actors to intervene in Iraq’s second largest city. Qaraqosh, Hamdaniya District – Local Christian and Shabak forces vie to police this decimated ghost town and surrounding Christian areas, a part of the larger Baghdad versus Kurdish competition and demographic reshaping of the Ninewa Plains. Qayyara – US-supported and -trained Sunni tribal PMF have played a larger role in this relatively stable Sunni area south of Mosul, but tribal revenge attacks, Shi’a PMF on the outskirts, and a recent ISIL takeover of a liberated town illustrate the uneven control and stability even in safe and politically uncontested areas. Kirkuk – ISIL’s advance on Kirkuk created opportunities for Kurdish forces to tighten control over oil resources and Kirkuk city in this most coveted part of the Disputed Territories; however, a strong (for now officially accepted) PMF presence in the south, anchored with local Turkmen PMF forces, threatens future stability once ISIL is pushed out of Hawija district. Baiji — Shi’a PMF forces captured, looted, and still control this Sunni Arab district, knowns for its valuable oil refinery; with ongoing security threats from the frontline with ISIL and predatory armed groups still in the area, there has been minimal civilian return. Shirqat – Both Sunni and Shi’a PMF have played a large role in this Sunni Arab sub-district on the border of Ninewa and Salah ad-Din. Reports of mass forced displacement and abuses of the civilian population suggest a long road to reconciliation and recovery even after the eastern bank is retaken from ISIL. Kurdish Peshmerga fighters undergo international training to fight Daesh. A critical question is how much these LHSF actors exert control in a given area. Broadly, there are two spheres of control: areas under control of Iraqi Security Forces of the Baghdad-based Federal Government, and areas controlled by Kurdish forces and the Kurdistan Regional Government (KRG). Control in northern Iraq has been divided between the KRG and Baghdad since before the ISIL crisis, and there has been a long-standing disagreement over the status of some areas in Northern Iraq, known as the Disputed Territories. In its 2014 advance, ISIL captured much of the Disputed Territories. Taking these areas back from ISIL has offered opportunities for both sides to change the line of control, often facilitated by affiliated LHSF forces ​“holding” these areas. The research conducted in Kirkuk, Qaraqosh, Tuz, and Zummar illustrate how different LHSF control patterns play into this Baghdad-KRG competition. There are competing sublayers of control even within Baghdad- and KRG-controlled areas. Within Kurdish-controlled areas, control was split between forces reporting to the two main Kurdish political parties, the KDP and the PUK (best illustrated in the Kirkuk and Tuz research summaries). Within Baghdad-controlled areas, de facto control might be held not by ISF but by different PMF forces, which are formally part of the Iraqi Security Forces and report to the Iraqi Prime Minister, but in many cases give priority to the orders of their own leadership or their Iranian backers. The research summaries on Tuz, Tal Afar, Mosul, Baiji, Shirqat, and the Tikrit area illustrate some of the tensions in the PMF-Baghdad relationship. Finally, in most areas there are also a number of smaller, locally-recruited forces, from Sunni tribal forces (sometimes referred to as tribal hashd or hashd al-asha’ir), to local Turkmen, Shabak, Yazidi or Christian forces. They typically range from a couple hundred to a couple thousand members, and tend to affiliate with or be integrated into one of the larger forces – ISF, Kurdish forces, or one of the large Shi’a PMF groups. Although in some areas they are the primary security actors (e.g., Turkmen PMF in southern Tuz or parts of Kirkuk), in most cases they act as auxiliary forces to these larger security actors, helping to ​“hold” areas by manning checkpoints, conducting security patrols, or simply putting a local face on what are otherwise viewed as outside forces by local communities. (Although not included in this research, some Yazidi forces in Ninewa’s Sinjar district operate outside the remit of the PMF and the KRG forces). The situation is highly dynamic and the roles played by local, hybrid and sub-state security forces are continuously evolving. Although ISIL will likely be uprooted from areas it currently holds, including Tal Afar, Shirqat, and Hawija (in Kirkuk), ISIL has also proven capable of retaking areas that were liberated (e.g., in Qayyara). The lines of control between KRG and ISF might also shift if Baghdad challenges Kurdish expansion in the Disputed Territories since June 2014. The cards below show which actors were in control in each of the 11 case study areas as of early August 2017, and also include information on the conditions in each area, including the level of instability, the proportion of the displaced population that has failed to return, and the overall level of damage or destruction. 1 Research was conducted by joint teams of international and national researchers in most areas. However, in some more sensitive areas where access was constrained, only local researchers from that area conducted interviews. It was not possible to visit areas under ISIL control during the period of research (e.g., Tal Afar, Hawija in Kirkuk), but secondary research was conducted for a limited number of these areas where it helped to understand LHSF patterns in nearby areas or potential future flashpoints. Interviews focused on key informants, and although some civilians from each area were interviewed, large survey sampling was not part of the methodology. Data and findings from the field were cross-checked against other secondary research and analysis, and with researchers, observers, or local residents from these areas with some expertise in the LHSF dynamics in that area. 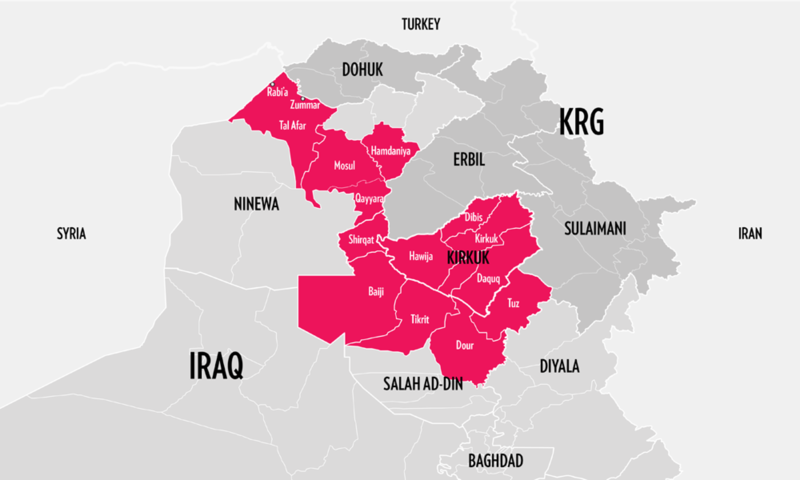 2 Field research was conducted in 15 distinct districts or subdistricts, however, some of the material from nearby districts or sub-districts was combined into joint research summaries above, notably in the Kirkuk governorate summary, the Tuz district summary, and the Tikrit area summary. The decision to focus on either a district or sub-district level, or to summarize trends across multiple districts or sub-districts in the below research summaries was determined by the nature of LHSF trends in that area.